Reid Hatley gazed upon the smoldering ruins of his North Idaho business one morning this past June. Someone had broken into the golf course accessory manufacturer to steal tools, then set fire to the shop and offices near the Coeur d’Alene Airport. He lost everything, including beloved clubs and the ball and scorecard from his best day on 18 holes, when he shot a stunning 58 at Hayden Lake Country Club in 2013. The pungent odor of scorched materials triggered tender memories of watching his family’s home on Spokane’s South Hill burn in the late 1980s. Hatley was in second grade, and he and his older sister walked home from school to find the firetrucks. The electrical fire wiped out both of their bedrooms, their toys and books and clothes – everything. “I instantly went back to being an 8-year-old kid standing there in the street, watching,” said Hatley, now 34, recalling his visceral reaction to what the arsonist had done to his 5-year-old company. Even his workers weren’t aware of what he had experienced in childhood and how it all came flooding back that morning. “I had to hold it together because I had 14 employees,” he said. 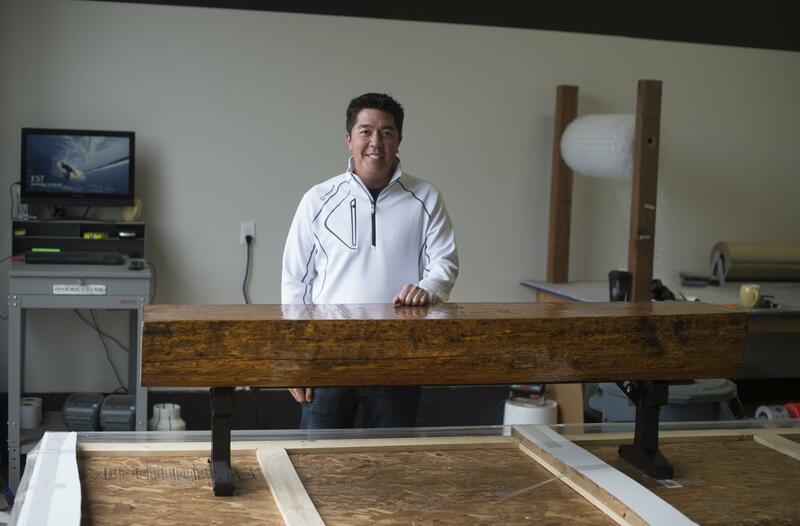 Four months later, RHI Golf is back to work making customized course signs, bag and club stands, benches, trophies and a catalog full of other products for a customer base that includes some of the best-known properties in the game. Pebble Beach, St. Andrews, Merion, Medinah, Seminole, Baltusrol and Gozzer Ranch, to name a few. The biggest order Hatley’s crew is bustling to fill is for the Tiger Woods-designed Bluejack National opening soon near Houston. Despite the devastating setback of the June 16 blaze and the months of down time, RHI held onto its customers and attracted even more business. “We had three months’ backlog before the fire, so we kept all of that, and then we booked out another three months. So we almost have a seven-month backlog at this point,” Hatley said. About 40 courses had awards on order when the business went up in flames. Even with all that support, he felt dejected and lost in the days after the fire. “I was sitting at my house, and I’d call my dad and I’d be in tears saying I don’t know what to do,” he said. He regards his father, Allen Hatley, senior partner of a Spokane-based farmland management company, as one of his two mentors. The other is his original business backer, skiwear entrepreneur Stan Kohls, former owner of the Seattle outdoor apparel maker Filson. Hatley asked them how he could turn the summer into a positive. “And both of them agreed: You need to go play, you need to go win some golf tournaments,” he said. It sounds counterintuitive, given the massive chore of rebuilding his company. He had to document the losses, contact customers and reconfirm orders, find and furnish a new facility, hire new employees and begin to replace inventory. But a therapeutic diversion was the right choice, his father said. Reid Hatley hadn’t played a full competitive season since 2008. “As I got playing in more and more tournaments, I fell back in love with competitive golf,” he said. He set out to win mid-amateur player of the year in both the Washington state and Pacific Northwest golf associations – and achieved both goals. The fire awoke some difficult childhood memories. But hitting the links again allowed Hatley to reminisce about learning to golf as a young boy, when his parents kept their Manito Golf and Country Club membership even as they struggled financially after the loss of their home. “Because that’s what kept my sister and I out of trouble,” he said. A 1999 Ferris High School graduate, Hatley was a standout golfer there and at the University of Arizona, where his career stroke average was 74.63. But a knee injury cut short his professional career, and he never made it to the PGA tour. He found himself burned out on competitive golf. The morning of the RHI fire, investigators knocked on the door of Hatley’s home in Hayden Lake. They asked to see his phone – a standard request to help rule him out as a suspect. Fire investigators had quickly suspected arson on top of a burglary. Another load of loot was left sitting by the front door. “I think that fire probably got out of hand even quicker than the people who set it thought it would,” he said. The damage was complete, totaling millions of dollars in losses. One high-end piece of machinery, a waterjet for cutting metal, cost over $300,000. The fire’s heat was so intense, “We had thick aluminum sheets that were curled into circles,” Hatley said. A Spokane Valley arson dog was brought in and detected gasoline and another accelerant where there shouldn’t have been any. The Kootenai County Sheriff’s Office and the Bureau of Alcohol, Tobacco, Firearms and Explosives are still investigating the crime. Before the fire, RHI had been operating 20 hours a day, seven days a week. Within two months afterward, the business was back to about half that pace, and now it’s up to 12-hour shifts with a dozen employees, including Hatley. RHI now has close to 1,000 accounts around the U.S. and in Scotland, Ireland, Norway, Netherlands, Spain and Australia. Hatley will attend the annual PGA Merchandise Show in Orlando in January. “I want to talk to our customers. They all want to know what happened and how we’re doing. What better way to answer their questions than to sit down and talk to them,” he said. And he’s looking forward to visiting Bluejack National, seeing his products on display and playing a round of golf with Woods. Allen Hatley said he’s surprised by his son’s intense recollection of their house fire a quarter-century ago. “I guess you don’t realize how that impacts a young child,” he said. This year’s similar tragedy appears to have motivated Reid to come back even stronger, he added. Published: Nov. 5, 2015, 8:17 p.m.